The Heronry Pond, looking east. The Heronry Pond was constructed, alongside the other ornamental lakes around the southern and eastern sides of Wanstead Park, between the 1720s and 1740s. Cradock’s 1725 Plan does not stretch far enough to the west for it to be ascertained whether or not work had started on the Heronry Pond by this date, though Rocque's 1735 map – which appears to depict the areas of both the later Shoulder of Mutton and Heronry ponds as being subsumed into a single water body - provides good evidence that it was at least not then complete. The Heronry Pond in something like its present form is first depicted on Rocque’s 1745 map, which had been surveyed the previous year. This is a little problematic, as the depiction of the serpentine lakes is rather schematic and they are not located accurately in the landscape. However, subject to these provisos, Rocque shows the Heronry Pond as a curving water body between the Shoulder of Mutton Pond to the west, and the Perch Pond to the east. Only one island is shown, and the other elaborations which may be seen on later maps do not yet exist. The western end of this pond is depicted differently on Searles’ 1779 Map , with the area between the two ponds occupied by two causeways with a small area of water between. The western causeway is straight, runs north-south and carries a path, while that to its east is sinuous in shape, meeting the north bank some distance east of where it meets the south. This arrangement is depicted on subsequent maps until the early 20th century, when the area between the causeways was filled in (though traces of the depression remain). A further causeway or pathway across the Heronry Pond is first depicted on the 1813 Rough Plan, and is depicted on maps up to and including, the 1863 25 inch OS Map. This was presumably a dam introduced to subdivide the pond into two separate areas, thereby maintaining two levels of water and intended to mitigate some of the problems associated with leakage by ensuring that water was retained where it would be most visible from Wanstead House. The Heronry Pond reached its greatest extent in the eighteenth century, when a number of islands were created out of the south bank, presumably in the time of John, 2nd Earl Tylney of Castlemaine (1750-1784). However, these have since been re-incorporated and though elements of this work survive, the overall size of the lake today is probably similar to what it was in the 1740s. Following the demolition of Wanstead House in the 1820s, the park was let to tenants for grazing and shooting. One of these cut the dam between the Heronry and Perch ponds in order to drain as much of the former as possible to create additional grazing land (or, perhaps more likely, to prevent the pond re-filling after it drained naturally). On the 1863 OS Map, the reduced pond is shown in a well-defined area hugging the north east bank, and extending to just behind the Mount. As this was the deepest part of the old pond, it has been suggested that it could have marked the course of the original, natural valley in this area before this was obliterated by the re-lining of 1906-7. Late nineteenth century newspaper reports suggest that the area of the (reinstated) pond near the north bank was about six or seven feet deep when full, but the depth of the remainder nowhere exceeded thirty inches. This thesis seems to be supported by the Rocque plan of 1735. As we have seen, Rocque shows a single large water body occupying roughly the area of the Heronry Pond, and extending into what is now the Shoulder of Mutton Pond. Although this scheme differs markedly from what was actually completed, it is noticeable that a long section of the projected north and north east banks of the 1735 water body precisely follows the line of the Heronry Pond as actually constructed. The north bank of the residual nineteenth century pond also partly follows this line. This perhaps offers a clue to how the lake was constructed, with a pre-existing valley in this area simply being extended at a shallower depth to the south and west to create a lake which would be visible from the gardens. A possible confirmation that part of the north bank follows an older feature is that some of the buried archaeology to the north of the Heronry Pond - some known to be prehistoric, and some assumed to be Roman - appears either to be aligned with the bank or at 90° to it. The dam between the Heronry and Perch ponds was reinstated by the Corporation of London after it acquired Wanstead Park in 1882. The 1894-6 OS Map depicts the restored pond as slightly smaller than it was in the earlier nineteenth century, with the islands to the south having been mostly lost, although there was still a small channel of water surrounding the south-western island. 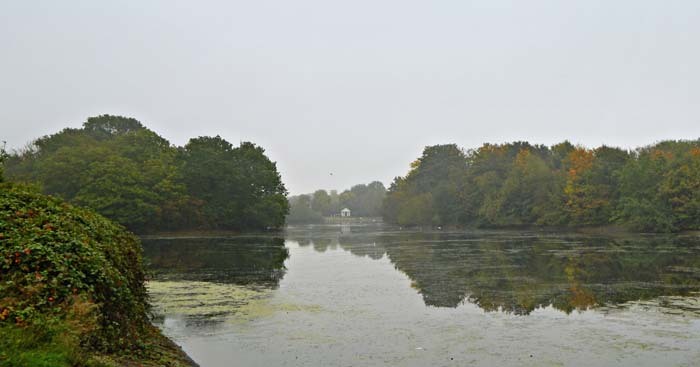 Extensive works were undertaken on the Heronry Pond in the early 20th century, including the re-digging of the pond and provision of a concrete rim and base in 1906-7. This project was undertaken by the West Ham Distress Committee to provide work for the unemployed and render the lake more suitable for use as a boating and bathing lake, as well as solving long-standing problems associated with water retention which had become acute after 1901. This work also involved some reconfiguration of the outline of the pond, with all of the southern islands being definitively left outside its area. 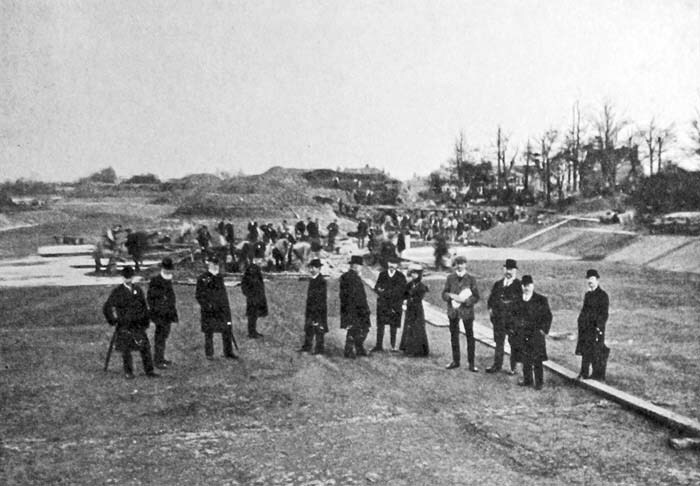 Members of the West Ham Distress Committee visit the Heronry Pond in 1907. A V1 flying bomb is recorded as having hit the pond during WWII. This created a hole in the lining of the pond, and led to it leaking. It was not repaired for some time, and it is possible that the clay lining underlying the concrete was compromised during this time. Some earthworks relating to the earlier size and shape of the Heronry Pond survive and were recorded by the 1990 Debois Survey, particularly the former channel which surrounded the south-western island prior to 1907. However, the radical works to the pond itself at this time have obliterated all traces of its earlier history. One of the bays at the western end of the pond has more recently been lost after silt dredged from the bottom of the pond was dumped into it during maintenance works.